What was known? The cardiofaciocutaneous (CFC) syndromeis a syndrome where patients have multiple congenital anomalies related to mentation, growth, cardiovascular system skin, eyes, gastrointestinal tract and central nervous system. One-year-old Indian boy was referred to our center at 8 months of age with some dysmorphic features and developmental delay for evaluation. He was a product of a full-term normal delivery with a birth weight of 3.6 kg (more than the 95 th percentile). He had transient neonatal jaundice which needed phototherapy but without any complications. Developmental history showed a delay from the beginning with the child unable to crawl, sit or hold objects in hand or produce any sounds like the normal children. Family history revealed the child being the third sibling after two normal children and two early abortions. There was no history of consanguineous marriage. No similar condition existed in the family. Clinically his weight was 10 kg (90 th percentile), height 73 cm (75 th percentile), and head circumference 44.5 cm (25 th percentile). 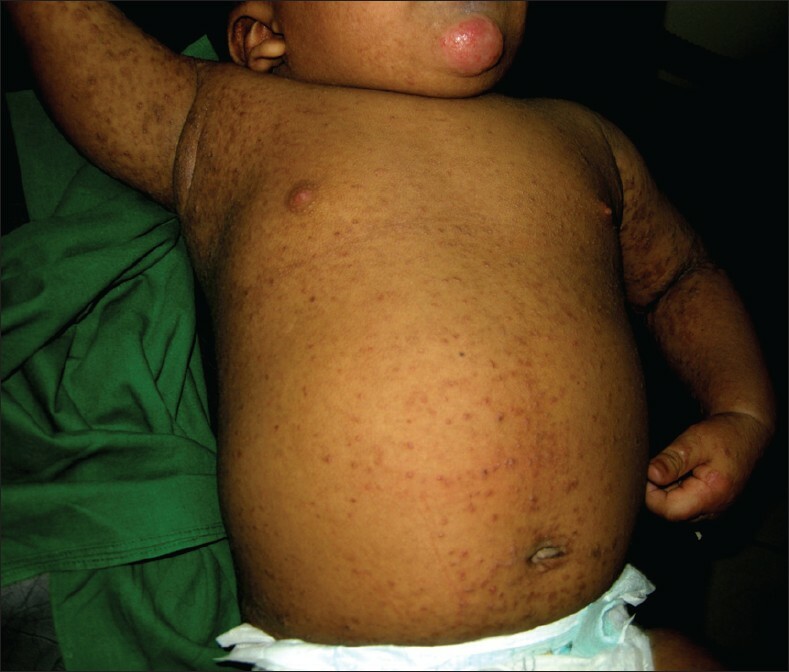 Dermatological evaluation showed a dysmorphic child with asymmetrical face, bitemporal narrowing and prominant metopic sutures, epicanthic fold, wide mouth, sparse hair, and absent eye brows [Figure 1]a-c. His skin was dry and mildly hyperkeratotic; eczematous lesions were found on his neck and extremities, keratosis pilaris on his arms [Figure 2], seborrheic dermatitis on his scalp, and miliaria on his back. There was an evidence of a vascular hemangiomatous plaque measuring 5 cm×3.5 cm involving the medial aspect of right lower limb [Figure 3]. The results of routine hematological examination, blood biochemistry analysis, urinalysis, thyroid function tests, and serum zinc level assessment were within the normal ranges. Echocardiography was suggestive of small secundum atrial septal defect and patent ductus arteriosus. Ultrasound of the abdomen showed mild hepatosplenomegaly. MRI scanning of the brain showed bifrontal subdural T2 hyperintense areas plus prominence of the frontotemporal subarachnoid space and corpus callosum hypoplasia. There was no evidence of hypoplasia. Karyotype revealed 46 XY, involving 9p11q21.2 chromosome. 1. Reynolds JF, Neri G, Herrmann JP, Blumberg B, Coldwell JG, Miles PV, et al. New multiple congenital anomalies/mental retardation syndrome with cardio-facio-cutaneous involvement-the CFC syndrome. Am J Med Genet 1986;28:413-27. 2. Weiss G, Confino Y, Shemer A, Trau H. Cutaneous manifestations in the cardiofaciocutaneous syndrome: A variant of the classical Noonan syndrome: Report of a case and review of the literature. J Eur Acad Derm Venerol 2004;18:324-7. 3. Fryer AE, Holt PJ, Hughes HE. The cardio-facio-cutaneous syndrome and Noonan syndrome: Are they the same? Am J Med Genet 1991;38:548-51. 4. Neri G, Zollino M, Reynolds JF. The Noonan-CFC controversy. Am J Med Genet 1991;39:367-70. 5. Ward KA, Moss C, McKeown C. The cardio-facio-cutaneous syndrome: A manifestation of the Noonan syndrome? Br J Dermatol 1994;131:270-4. 6. Leichtman LG. Are cardio-facio-cutaneous syndrome and Noonan syndrome distinct? A case of CFC offspring of a mother with Noonan syndrome. Clin Dysmorph 1996;5:61-4. 7. Lorenzetti ME, Fryns JP. Retinitis pigmentosa in a young man with Noonan syndrome: Further evidence that Noonan syndrome (NS) and the cardio-facio-cutaneous syndrome (CFC) are variable manifestations of the same entity? Am J Med Genet 1996;65:97-9. 8. Neri G, Zollino M. More on the Noonan-CFC controversy. Am J Med Genet 1996;65:100. 9. Legius E, Schollen E, Matthijs G, Fryns JP. Fine mapping of Noonan/cardio-facio cutaneous syndrome in a large family. Eur J Hum Genet 1998;6:32-7. 10. Wieczorek D, Majewski F, Gillessen-Kaesbach G. Cardio-facio-cutaneous (CFC) syndrome: A distinct entity? Report of three patients demonstrating the diagnostic difficulties in delineation of CFC syndrome. Clin Genet 1997;52:37-46. 11. Kavamura MI, Peres CA, Alchorne MM, Brunoni D. CFC index for the diagnosis of cardiofaciocutaneous syndrome. Am J Med Genet 2002;112:12-6. 12. Tartaglia M, Mehler EL, Goldberg R, Zampino G, Brunner HG, Kremer H, et al. Mutations in PTPN11, encoding the protein tyrosine phosphatase SHP-2, cause Noonan syndrome. Nat Genet 2001;29:465-8. 13. Aoki Y, Niihori T, Kawame H, Kurosawa K, Ohashi G, Tanaka Y, et al. Germline mutations in HRAS proto-oncogene cause Costello syndrome. Nat Genet 2005;37:1038-40. 14. Rodriguez-Viciana P, Tetsu O, Tidyman WE, Estep AL, Conger BA, Santa Cruz M, et al. Germline mutations in genes within the MAPK pathway cause cardio-facio-cutaneous syndrome. Science 2006;311:1287-90. 15. Niihori T, Aoki Y, Narumi Y, Neri G, Cave H, Verloes A, et al. Germline KRAS and BRAF mutations in cardio-facio-cutaneous syndrome. Nat Genet 2006;38:294-6. 16. Roberts A, Allason J, Jadico SK, Kavamura MI, Noonan J, Opitz JM, et al. The cardiofaciocutaneous syndrome. J Med Genet 2006;43:833-42. 17. Somer M, Peippo M, Aalto-Korte K, Ritvanen A, Niemi KM. Cardio-facio-cutaneous syndrome: Three additional cases and review of the literature. Am J Med Genet 1992;44:691-5. 18. Neri G, Kavamura MI, Zollino M, Opitz JM. CFC syndrome. Am J Med Genet A 2003;116A:410. What is new? Combination of classical clinical features should raise the suspicion of rare entity like this one.